Back in April when I visited Yaz at Easter time, he gave me a jar of homemade fig jam and an accompanying recipe for Turkish fig pudding. The jam sat in a corner of my kitchen in a corner with my good intentions until my mum cleaned up on one of her visits (I tell her she doesn’t need to tidy up but she insists) and opened the jar so she could take half home. Once opened, it seemed time to make the pudding, and once tasted I was amazed at how indescribably good it was. 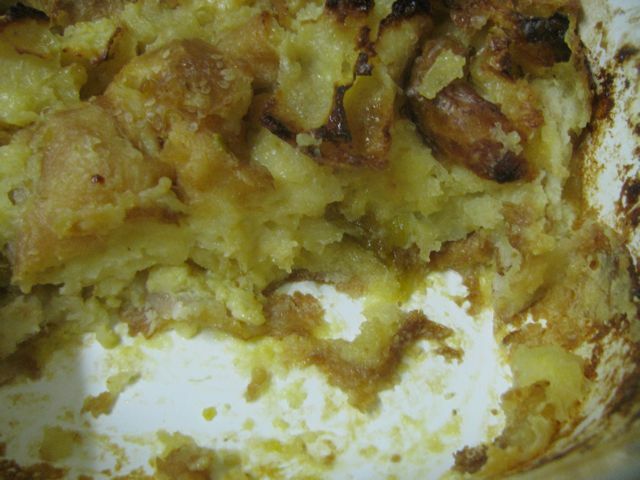 The Turkish fig pudding is a bread and butter pudding with a difference. It is quite unlike the ones I have made before. No fruit, no chocolate, not even a scattering of coconut on top. Instead it had lots of cream and Turkish bread, which was a challenge. 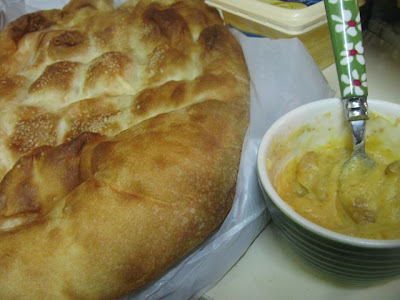 We have many fine Turkish shops selling bread that is so good it is tempting to just eat it before it becomes pudding. It comes in large flat soft loaves with indentations that encourage pulling it apart to dredge through dips. The first loaf I bought was torn into chunks and dipped into hummus. The time I bought a loaf for the same purpose, I made the pudding that night. I was glad I only needed half the loaf so we still had more to eat.. 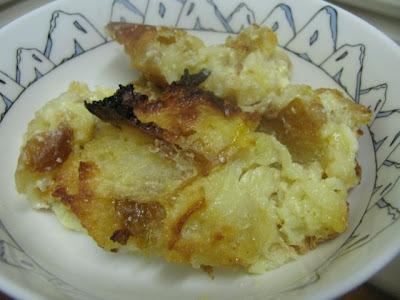 I had never thought to try Turkish bread in bread and butter pudding before but it was wonderful. It was also my first time using rose water in any sort of baking and I am pleased to say it was a success. I was so wary that I added it a quarter of a teaspoon at a time, tasting after each addition. This pudding is different from my usual desserts and has to be tasted to be believed. I kept thinking of jelly though bread, butter, jam, cream and eggs surely do not make a jelly. They do make a melt-in-the-mouth bready custard that is more creamy than eggy. The combination of fig and rosewater imparts an exotic sweetness that cloys and yet satisfies in a similar way to honey. Perhaps the rosewater made me think of Turkish delight and hence the taste of jelly. It is rich so you wont want too much, though you may need another sneaky spoonful when you start to get curious about how good it tastes. I highly recommend it in small servings. I would like to recommend that you use fig jam made by a good friend who makes figs with the fruit of the trees in his backyard, but not everyone is so lucky. I am sure any fig jam would still make a pudding to cause fathers and babies alike to swoon. Actually Sylvia only had three spoonfuls but that is a good result with her. I took some to my parents and my dad was delighted by it. I am sending this pudding to Susan for YeastSpotting which showcases all things yeasty around the blogosphere including baking with bread. Preheat oven to 200 C (I had mine at 210 C) and grease a medium oven proof dish. Slice the Turkish bread in half to make two thinner pieces. Roughly tear into bite-sized pieces. 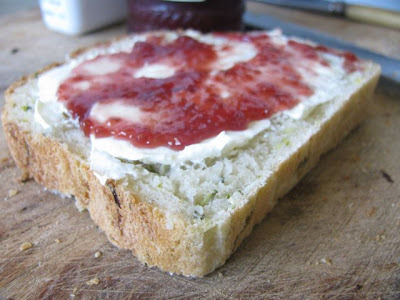 Combine butter and jam and then spread over pieces of bread. I found this time consuming but I think it was worth it. Place buttered bread in prepared dish. Combine cream and milk and add sugar and rosewater to taste. (I prefer to taste before the raw eggs go in). If you are a rosewater novice like me you can add a little at a time to see how much you need. Lightly whisk in eggs and pour the mixture over the bread. I pressed it into the bread a little but there didn’t seem to be any need to leave it to soak like some other bread and butter recipes I have encountered. 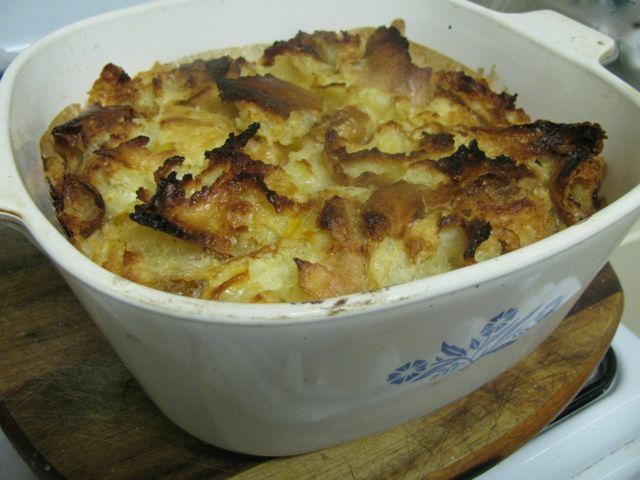 Bake for 30 minutes or until it is crisp on top and the custard is set. After 30 minutes when I put a spoon in, the mixture was too runny so I baked mine an additional 30 minutes. On the weekend I went to my mum’s and fulfilled my promise to my niece Maddy to do some cake decorating with her. Ill health had kept me from helping to make her birthday cake a few weeks back so we did the next best thing and made Christmas in July Cupcakes. First I had to explain the idea of Christmas in July to my nieces. Many Australians will find themselves in the Northern Hemisphere at Christmas and miss the sun, the barbecues and the beach. I have never had that sort of Christmas and love the idea of celebrating Christmas at a time of year when it is cold enough to need a festive dinner of hog’s head and plum pudding. 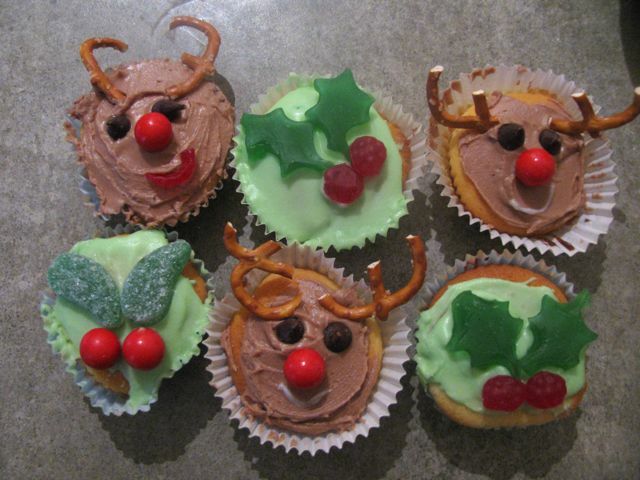 Cupcakes might not be traditional Christmas fare but they are perfect for some easy decoration with kids. My mum had made some gluten free cupcakes for us to ice. These are very popular in my family. Other vanilla recipes such as small cakes that I grew up making or these excellent hot milk cupcakes would have also been fine. My preference, however, would be a chocolate cupcake such as these choc honey muffins (if we don’t quibble over differences between cupcakes and muffins). I was inspired by Cindy to make some Reindeer Cupcakes. Maddy and Quin were in charge of these. 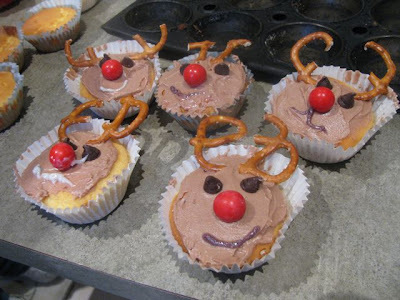 They had the bowl of light brown icing, coloured with cocoa, some jaffas for noses, choc chips for eyes, pretzels to break into horns and we found some old tubes of glitter icing for the mouths. The girls had fun with drawing different expressions on the mouths. 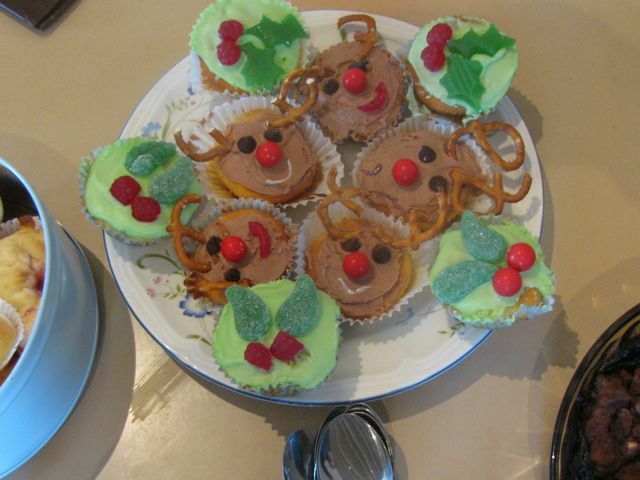 Grace and Ella were in charge of the Holly Cupcakes, which took a bit more experimentation. They decided on some light green icing. At the lolly shop I found some green gummy frogs, mint leaves, raspberry jubes, as well as the jaffas. The gummy frogs were best for cutting out holly leaves though I liked the look of the mint leaves too. We also cut the raspberries into smaller berries for the holly. The jaffas were ok as berries but are not gf. Ella was not well but cheered up at the cake decorating. We stayed overnight at my parents so they could look after Sylvia (with a lot of help from my sister Susie and her girls) while we went to the cinema to see Inception. It was an intense, immense and thought provoking film. More car chases, guns and explosions than I care to see, but lots of intriguing ideas and breathtaking landscapes. It required constant attention to follow a complicated plot so I was glad we went to the earlier session. The next day we had a birthday dinner for my brother Andy. After the tacos, the table was spread with mum’s chocolate pudding and sponge birthday, Fran’s fruity cupcakes and the Christmas in July cupcakes. 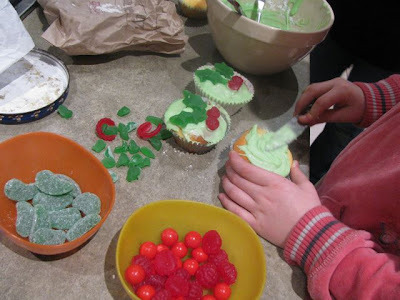 I think the girls would have preferred to eat the icing and lollies off the decorated cupcakes. Maddy was disappointed that the pretzels had softened overnight. Sylvia loved poking her finger into the cupcakes and licking it. I just preferred the chocolate pudding and sponge cake. It was a lovely afternoon with the family. The boys went off to play golf after lunch and the girls sat around cuddling Andy and Erica’s new baby Ashton. I was fascinated by how much the nieces loved Masterchef. 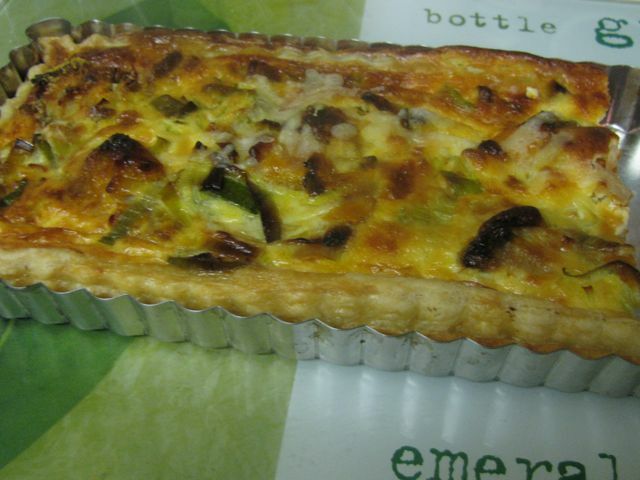 We left with a leek, brie and pumpkin tart and a chickpea curry that my mum had made. As I write this post I have been watching Masterchef where the two finalists must make omelets as part of the basic kitchen skills tests. They say you can’t make an omelette without breaking an egg but I beg to differ. I have never made an omelette before in my life but this weekend I had my first attempt. I am pleased to say that no eggs were broken in the making of this omelette. I have always wanted to try making a tofu omelette. I don’t like eggs but I love the look of a fluffy omelette as it folds over on itself. So an omelette full of tofu but no eggs appeals to me. Though I wanted to try the Vegan Brunch one (as raved about by Cindy), but it was Ricki’s beautiful stack of omelettes in her Eggs Faux Yung that got me cooking. It was only when I had made it, I realised that I have never eaten an omelette nor the eggs foo yung that Ricki based her recipe on. I just loved her picture. The omelettes were far softer and lighter than I expected, though pleasingly crisp on the outside. The omelettes were full of flavour and tasted like the sort of thing I would love to be served in a Chinese restaurant, even if the sauce was not really my sort of thing. However I couldn’t tell you exactly how close they are to the dishes they imitated. My omelettes weren’t perfect circles like Ricki’s. If you look at them on the frypan, they look more like the craggy outlines of countries in a map of the world. I was racing around too much to worry about this, but if I had time it wouldn’t be too difficult to shape the edges. My leftovers were not very pretty. 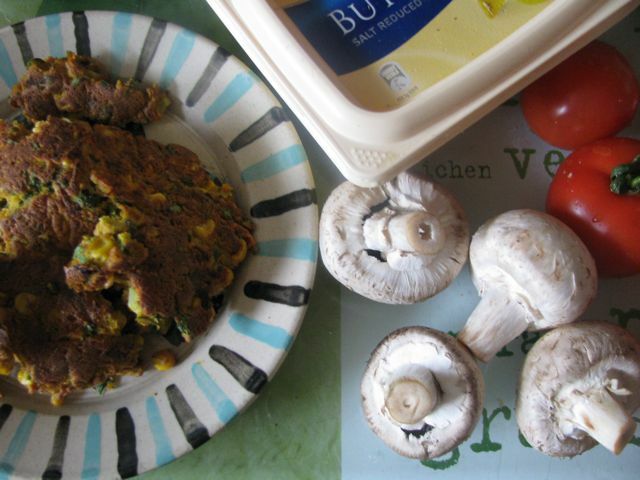 So on Saturday morning between swimming and heading off to visit family, I chopped up the omelettes and turned it into a scramble of some kind to eat with potato scones and a stirfry of mushrooms, spring onion, tomatoes and broccoli. A substantial brunch to see us on our way. I first determined to make this dish when Helen of Fuss Free Flavours announced that she and Sarah of Fingers and Toes were hosting an event called the Breakfast Club. 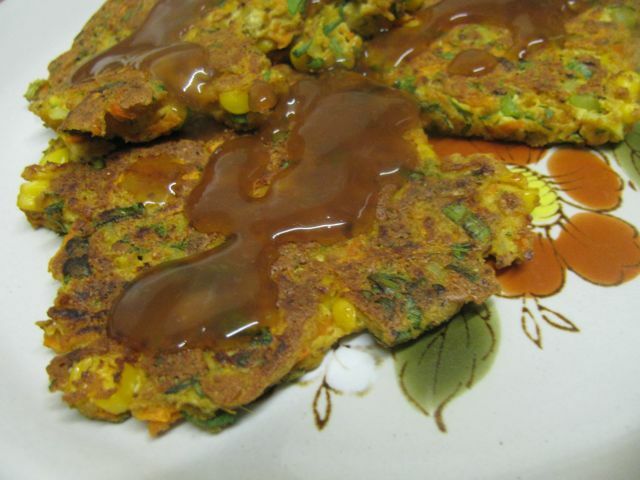 The first month was Asian and I had intended to send in these omelettes but didn’t get organized. July’s theme is Eggs (with an acceptance of faux egg dishes from those like me who don't eat eggs) so I decided I hadn’t missed my chance. So I am sending this Eggs Faux Yung Scramble to Sarah. 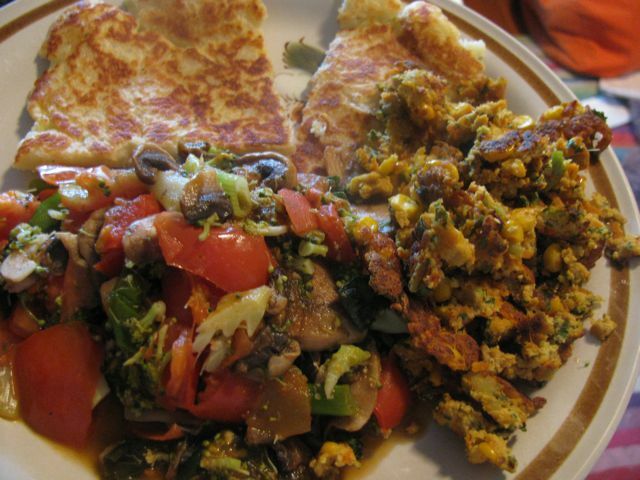 Combine the omelet ingredients in the food processor. Stir in the vegetables. Heat a heavy bottomed frypan (mine is non-stick) over low to medium heat and lightly oil. Spoon dessertspoonfuls onto frypan and cook for about 10-12 minutes or until the mixture sets and dries slightly. When you flip it the underside should be golden brown. Fry another 5-6 minutes on the other side or until golden brown. Repeat until you have finished the mixture (I did about 4 batches). While the omelets are frying, make the sauce. Firstly combine cornflour, soy sauce and an additional tablespoon of stock in a small saucepan. Add the remaining stock, Tabasco, and sesame oil. Bring to the boil, stirring frequently. When it boils, it should thicken and be taken off the heat. If it doesn’t thicken, simmer until it is just slightly thickened. Serve the omelets in a pile with sauce. Ricki suggests fried garlic and/or spring onion as a garnish. I didn’t have time for garnishes but like the idea. Instead I just served it with Sylvia's leftover steamed vegetables. This week I had bought quinoa and I wanted to make sausages. I could only find burger recipes so decided to go with this Smoky’n’Spicy Lentil Potato Quinoa Burgers recipe. Except I didn’t have enough potatoes. 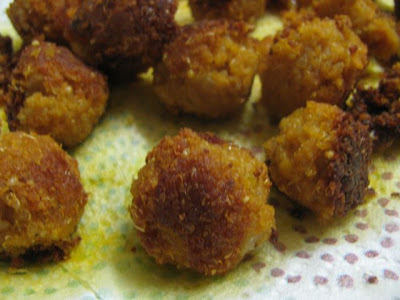 Then the burgers were going to be rissoles with gravy. 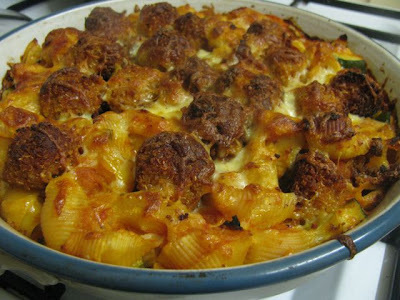 Finally I fried them and cooked in a pasta bake. I hate even shallow frying so after doing half the recipe I baked the rest as a loaf. The mixture was ok but the bake was great. I have recorded what I did as a work in progress because this blog is really about what I do rather than recipes that are triple tried and tested. The blog is about my journey rather than my results. The pasta dish was excellent comfort food. The next night I didn't bother with pasta and just served the mixture mixed with tomato sauce topped by steamed vegetables (including Sylvia's leftovers). I liked that the mixture was full of protein, vegan and gluten free but it needed some more vegetable for a bit of added moisture. It has been one of those weeks where work has been draining due to small tasks blowing out into herculean labours. I have cooked with Sylvia emptying the tea towel drawer at my feet. She has put away tins of chickpeas in the right place in the pantry and then taken them out again. At least I can come home and have her remove my shoes and fetch my slippers. Yes, there are some benefits to a daughter with a shoe obsession. It is also a week in which the country has shown it is more interested in food than politics. We have the debate between contenders for leadership of our country on Sunday but it is televised early so it doesn’t clash with the Masterchef finale. Speaking of Masterchef, I have promised E to throw bricks at the television if Callum wins. He is a sweet kid and a good cook but if he won it would be like the apprentice running the restaurant while the chef peels piles of potatoes. He lacks Marion's inspiration, Jonathan's technique and Aaron's attitude. This year, with serious contenders being eliminated far too early, it seems that luck is as important as skill in the contest. However, I have grown to appreciate Adam’s skills and attitude, so if he wins I will be somehow content. Jim’s pancakes show how creative you can be with pancakes (thanks Lorraine). Ferris wheel pancake, anyone? Ruth’s Stump’d blog is a great read about an expat Aussie living in the USA. Check out her reminisces about Melbourne brunches. I love the premise of Round the World Vegan. Keira sets out on virtual travels by cooking the food of different countries. This week she has been cooking Australian food which excited me because it reminds me so much of food from my own childhood. Britain’s July Observer Food Monthly focuses on Vegetarian food. Not only does it have celebrity’s and chef’s favourite vego recipes but there are some interesting interviews with Paul McCartney and other celebrity vegetarians. Place quinoa in a small saucepan with 1½ cups of water and cover with a lid. Bring to the boil and then simmer for about 15 minutes. Turn off the heat and leave lid on another 5 minutes. Heat oil in a small saucepan and fry onion til golden brown. Stir in garlic for a minute. Add lentils, salt and 1½ cups water. Cover with a lid, bring to the boil and simmer for about 10 minutes or til lentils are cooked. My lentils were starting to stick to the bottom after 10 minutes so I left it sit off the heat with the lid on for another 5 minutes. 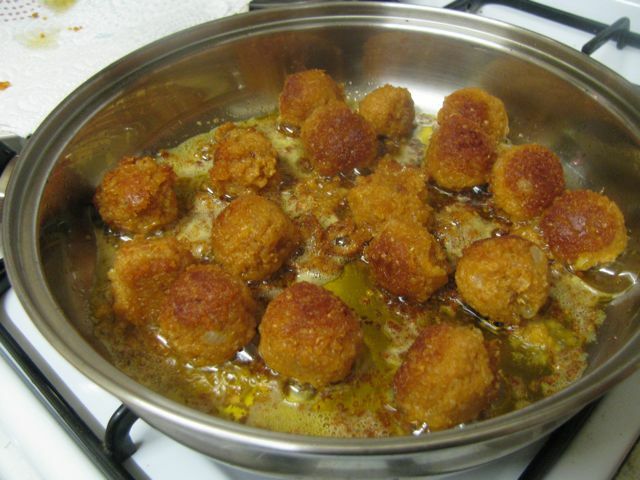 Mix lentils and quinoa with remaining ingredients (except oil) and roll into small balls the size of walnuts. Fry in about ½ cm of oil for 15-20 minutes til crispy and drain. Or cook as burgers or in a loaf tin. I served the balls (using half the mixture) by baking with pasta, tomato sauce, pumpkin, zucchini and mozzarella. 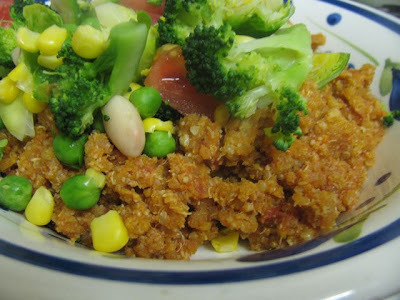 I crumbled the loaf I made with the other half of the mixture, mixed it with some tomato sauce and served it with steamed vegetables. Last Wednesday at midnight I was brushing mandarin syrup on a cranberry cake remembering childhood dentist visits. It was also a day for new shoes and on the weekend we went to visit my parents, to share cake and show off the shoes. But it all started with the giant mandarins. E swore that the giant mandarins were the only ones he could find in the supermarket. Sylvia wasn’t keen on them and nor was I. 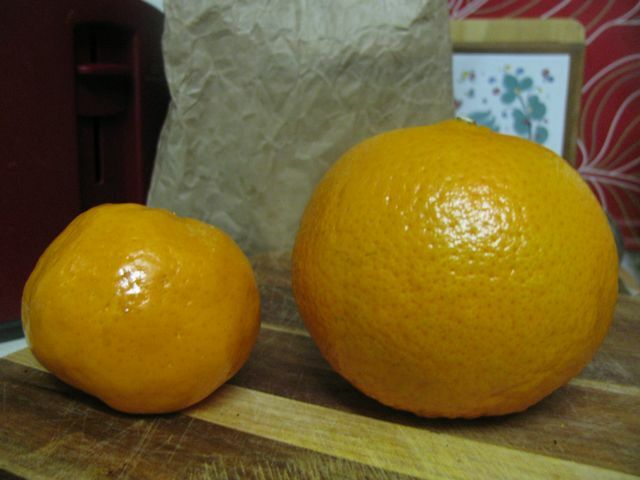 We like imperial mandarins, which are much smaller. (See photo.) So I decided to make cake with them. I also stumbled upon a packet of frozen cranberries at a posh supermarket and had some yoghurt that needed using. A quick internet search turned up Smitten Kitchen’s Lemon-Blueberry Yogurt Loaf. I decided to make the loaf with mandarins and cranberries. As always I was full of good intentions to bake early on Wednesday but the day was busy and Sylvia wasn’t keen on sleeping. We had an excursion to the shopping mall to get fitted for her first pair of hard sole shoes. She still prefers her old soft Dunlop volleys that are full of holes. 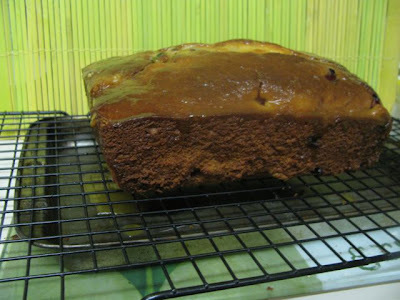 In over three years of blogging, this is my first syrup cake. I dislike the idea of soaking a cake in syrup and too many of them are made with lemon juice. However this was my opportunity to use some of the mandarin juice. Mandarins are so sweet and fragrant that I thought they might taste different to lemon. The cranberries also seemed a good idea. 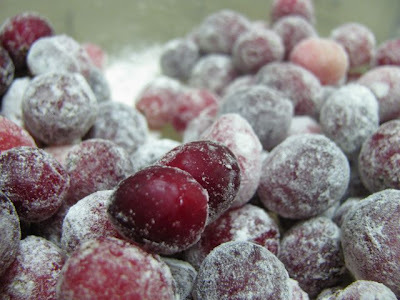 I rarely see fresh or frozen cranberries (probably never) so am always curious about them. When in Scotland last year I put them in a cranberry banana cake and loved it. I thought that their sourness might offset the sweetness of the cake. What I didn’t reckon on was how frozen hard they were. Blithely I tossed some cranberries in the cake without defrosting and paid the price. The cake took twice as long to bake as the recipe said. Hence I found myself at midnight brushing the cake with syrup. I was tired and just wanted to go to bed by then. To make matters worse when I tasted the syrup it wasn’t any better than a lemon syrup. It’s all citrus, I muttered to myself, in displeasure. I found myself wondering why sour cranberries were interesting and sour lemons were distasteful. My mind wandered back to primary school where a dental van visited our country school every so often and gave all the kids free check ups. If your teeth were good you got a butterfly made of dental cotton bud wads. But what I remember most was the cleaning treatment, which entailed sitting in the dentist chair forever with a mouthguard full of horrid orange fluid. It made me feel ill. The cake was far better than the dental van fluid. 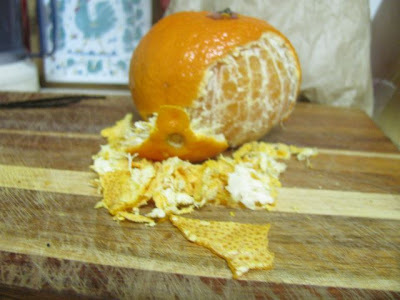 The mandarin wasn’t as intense as I had hoped, even where the syrup was sticky at the top. The cranberries were really sour, especially those at the bottom of the cake which were not soaked in syrup, but the bursts of fruit saved the cake. 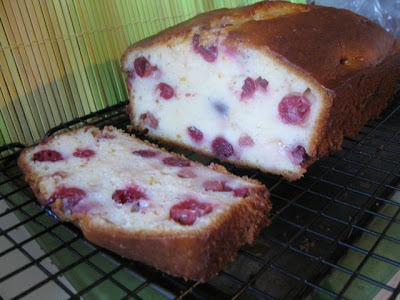 I loved the moist soft crumb but it would have been too bland without cranberries. I'm glad to have made this cake but I have no desire to make syrup cakes again. Too many bad memories. 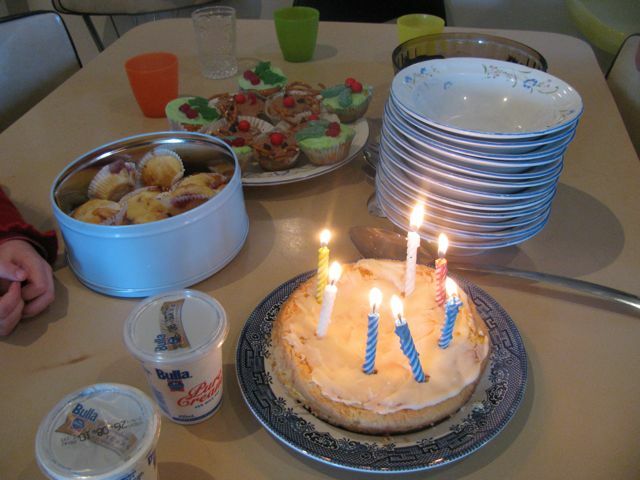 Unlike me, my mum loves lemon in desserts so I took some of the cake down to her place on the weekend. She loved it. E liked it but kept telling me it was the wrong time of day to eat it. So I left some with my mum and took away a slab of her excellent, soft, dark gingerbread cake (I have asked for the recipe). A great exchange! We had a lovely time at my mum and dad’s place. My nieces were there and lots of fun. Mum’s chooks are quite grown up now and producing eggs. When we were little we just shooed our chooks out of the way but Ella and Grace were delighted at picking them up. 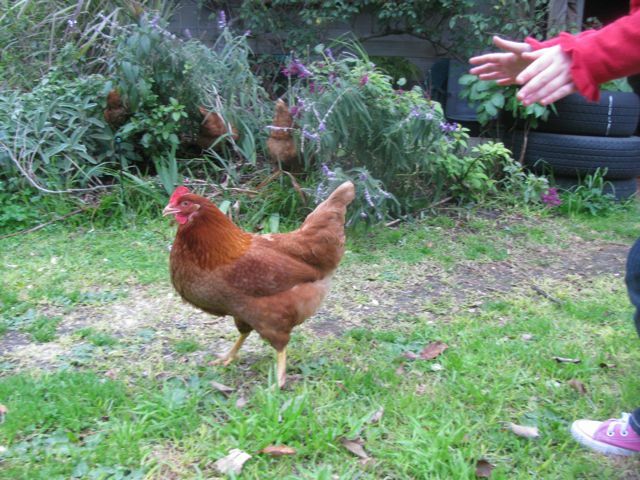 We even tried to lure the chooks onto the mini trampoline with worms but they didn’t fall for it. Woody amused us though by wearing E’s cap. Sylvia is still scared of Woody but can spend all day on the swing or pushing the doll’s stroller. She was too little to join in with the dress-ups but had fun on the piano with her cousins. I spent some time with Maddy on her latch hook project and discussed Masterchef with the girls. We stayed for dinner and had a delicious roast dinner and apple sponge. A fine way to spend the weekend. Preheat the oven to 350°F. Grease and line a loaf tin. 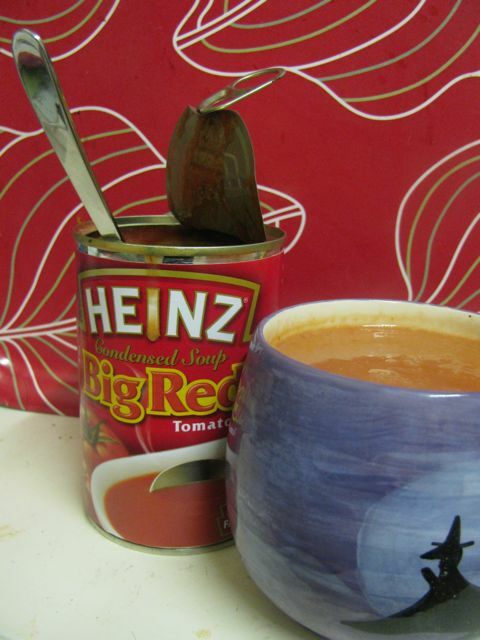 Deb suggested an 8½ by 4¼ by 2½ inch tin but my tin is a little narrower. Lightly whisk the yoghurt, sugar, eggs, zest, vanilla and oil in a large bowl. 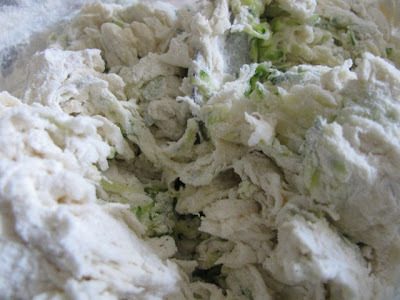 Gently stir in 1½ cups of flour, baking powder and salt until mixed. Toss cranberries with 1 tablespoon of flour and fold into batter. While cake is baking make the syrup by gently simmering the juice and sugar in a small saucepan until the latter has dissolved and the liquid is clear. Set aside. 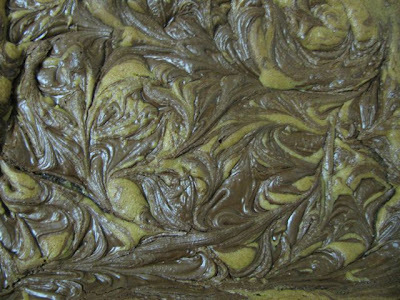 Leave cooked cake in tin for about 10 minutes – or if it takes forever to cook and comes out of the oven at an outrageously late time like mine just remove from tin earlier but be very gentle, even though patience is at low ebb at this time of night. Flip cake upright on wire rack and place a shallow oven tray beneath rack to act as a drip tray (NB I usually line a rack with a tea towel but didn’t for this cake). Make lots of holes all over the top of the cake with a skewer and carefully pour or brush the syrup over the cake while still warm. This cake tasted excellent warm but was still soft and moist but not soggy after about 5 days. 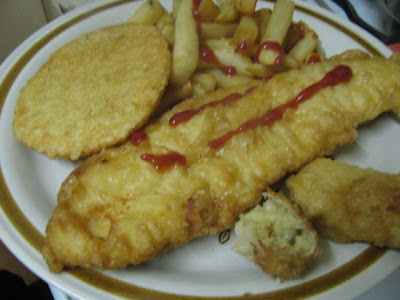 Through my childhood, the main fast food that we had was fish and chips. I wasn’t quite old enough to have them wrapped in newspaper – health and safety regulations had already kicked in – but we were a good Catholic family who often ate fish on Fridays, and gave up meat altogether on Fridays in Lent. As a child I didn’t always have fish - when it wasn't Lent. 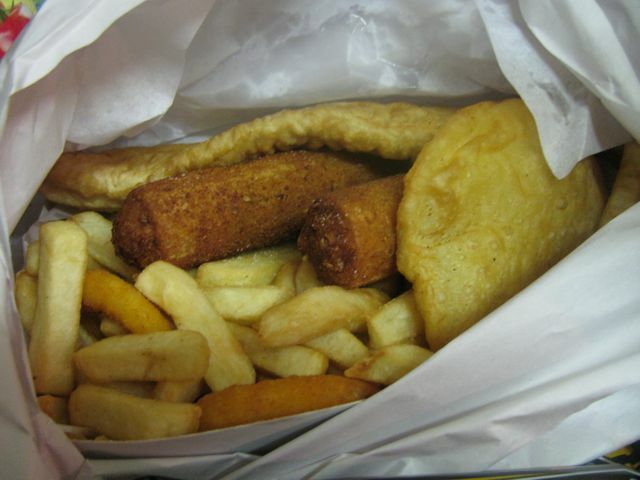 We usually had a choice of flake (in batter, of course), chiko roll or dim sims. I often had the fried or steamed dim sims. Always with chips and potato cakes. 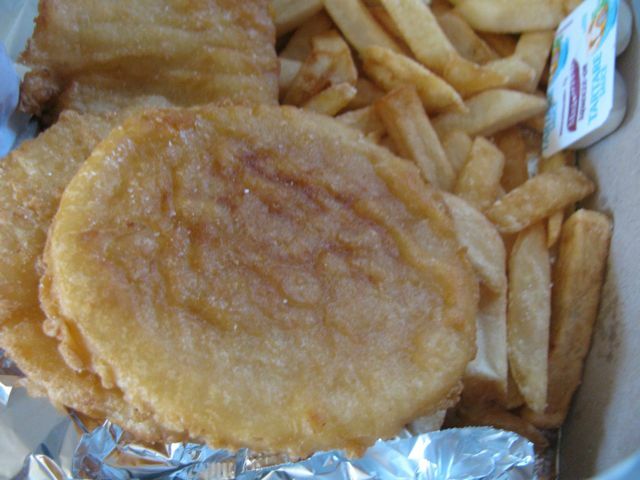 The latter are slices of potato dipped in batter and fried, also known in some other Australian states as scallops. 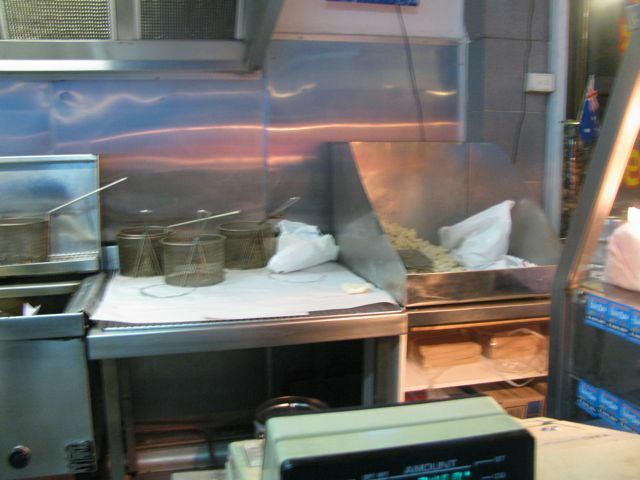 The fish and chips shops also usually sold other types of fish, a burger with the lot, steak sandwich, sav in batter, calimari and onion rings, but these were less frequent in our orders. No matter what was ordered, we always just called it fish and chips or fish’n’chips. I still talk about having fish and chips today though I am no pescitarian, vegaquarian or fish-and-chippocrite (a term learnt from a friend of mine who ate fish but no other flesh). Fish and chips are integral in the memories of my childhood. When we were camping in our friend’s paddock as young 10 year olds we organized for her mum to buy us fish and chips and we were upset when the wind not only blew in our tent but blew dust over the remains of the fish and chips. On hot summer nights my family would go to Lorne for fish and chips by the beach after a cooling swim. On our last night in my childhood house (I lived there till I was 15) we sat on the floor of the empty lounge room and ate fish and chips. It was a meal for relaxing. 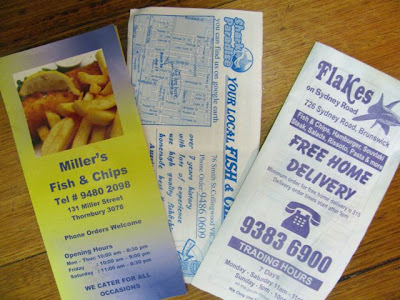 My mum wrote our orders on a piece of paper and rang it through to the fish and chip shop so it was ready to pick up when she arrived. When the package arrived at home, the smell was wonderful. Our little hands would sneak in for a chip so hot we could barely hold it. We had cane baskets specially for these evenings. My mum would rip off pieces of the paper that the fish and chips were wrapped in. She would use this to line the baskets and dole out the fish, chicko rolls and dim sims according to her list, give us a potato cake each and lastly she would divide up the chips. At the end of the meal the paper went in the bin, the baskets in the cupboard and there were no dishes. When I talk about fish and chips shops I mean the ones where you see them made fresh before your eyes. Where you see the piles of potatoes cut into chips, placed in wire baskets that were lowered into vats of hot oil for frying and then balanced above the oil to drain before being tipped onto white paper, doused in salt from a large metal shaker and then wrapped in a parcel. Not kept hot in a bain marie at a food mall or served with salad in a pub. 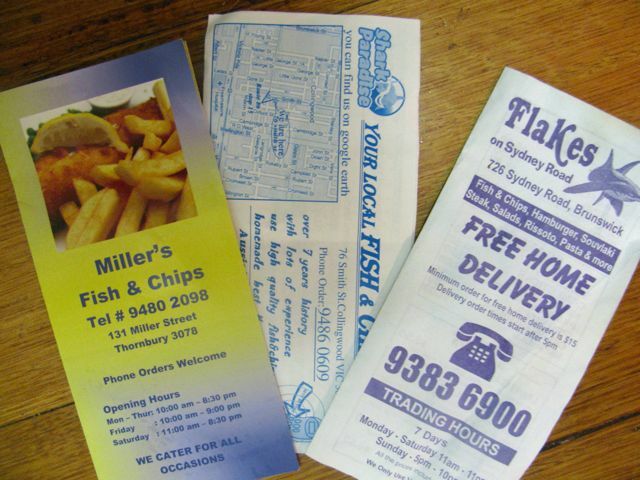 Traditionally the fish and chip shop could be identified by the faded chiko roll advertisement, a kitsch clock and bottles of sauce and vinegar. (I was once told in a greasy spoon that all women love sauce on their chips but if that is so then I am the exception that proves the rule.) The shops were uncomfortably hot on a summer’s day and welcomingly warm in winter. These days they tend to be a bit cleaner and brighter than in my memory but are still dominated by piles of chips and chip baskets above the vats of hot oil that steam up the windows on a cold day. We had fish and chips so often that I was surprised when I was older to find that they were particular to my part of the world. I never had heard of French fries until the Golden Arches hit our shores. They always seemed so stingy. Ours were generous chips, crisp on the outside and soft and fluffy inside. The paper-wrapped parcel warmed us on a cold night and steamed when we opened it. The fish and chips were freshly cooked, not the lukewarm, soggy chips that I encountered with disappointment in the UK chippie. As an adult, I was also surprised to find that dim sims come from Chinese and flake is actually shark. In the UK they call fish and chips a ‘fish supper’. E thought it hilarious that he was eating a shark supper when he first visited Australia. 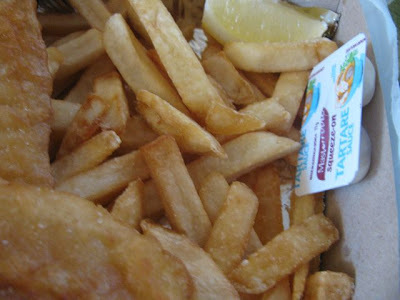 The other aspect of Australian fish and chips that is worth a mention is that concept of Minimum Chips. In the UK chippies and some more modern fish and chips shop you get a bag of chips, a box of chips, a small chips or a large chips. Our fish and chips shops have always had a price for minimum chips. This is the least amount of chips you can order. (For example at Millers, minimum chips costs $3.) E and I always find this is a generous serve for the two of us. When my family orders chips, my mum decides on the amount we want to buy – it might be $6 of chips. I don’t have fish and chips very often any more. Too much deep frying, stodge and salt. My brothers used to call it a grease and oil change. And not all fish and chips shops cook in vegetable oil. One of my main problems, however, is finding a protein alternative that is vegetarian but allows me to have the nostalgic fish and chip experience. So this year I have done some research, in Melbourne’s inner north. We got the brochure in our post box and they offer home delivery. I decided to try the burger and chips option. Burger with the lot is an Aussie tradition down at the fish and chip shop usually comprising beef burger, tomato, lettuce, cheese, beetroot, fried egg and tomato sauce on a bread roll. The vegie patties that take the place of meat burgers in a fish and chip shop seem to be more about mashed potato than protein. Mine was nice, but not overwhelmed by vegetables. It was a nice meal but seemed to lack the rituals that I associate with fish and ships. Millers Fish and Chips This was discovered through a recommendation from a friend. It is probably the closest I have found to a traditional fish and chip shop. Just a short drive away, I placed my order and waited with other hungry punters. It had the traditional wire baskets of chips, sachets of tomato sauce and tartare sauce, fridge of drinks and flashing lights outside. The shopping strip where it is located felt mostly deserted and well-lit Millers was like a beacon in a dark suburban night. The chips were honest, golden and crisp. The potato cakes had a craggy exterior that was a little chewy, a little crunchy as they should be. I also ordered corn jacks, which I enjoyed. They have the pleasingly chewy wrapper of chiko rolls and a creamy corny exterior. They don’t give enough extra vegetable or protein but yet they taste so good that they satisfy. But I would like to try the burger to see if it leaves me feeling less heavy. 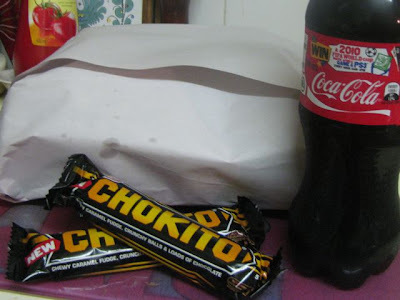 We had this meal just after feeling ill and needing a good dose of junk food - fizzy drink and chocolate bars included! I remembered this place from when we lived in Collingwood. It had more of an inner city vibe that caters for vegetarians. Unfortunately, walking past all the cosy cafes in Smith Street, a fish and chip shop feels a little cold and shabby. But it does live up to my memory of some fine vegetarian options. I chose the tempeh in batter and vegetarian dim sims, as well as the chips and potato cake. 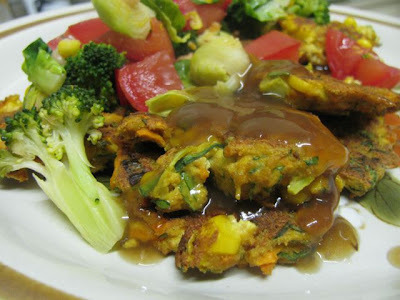 The tempeh in batter probably fulfils my need for decent protein but I am a little ambivalent about tempeh. The dim sims are not quite like those we would order as kids but they were delicious with a chewy fried skin and lots of veggies inside, seeming to be mostly cabbage. Unfortunately, with a longer drive home from Shark Paradise, the food was not steaming hot by the time we got home, which was good for Sylvia who loved the chips but not so good for E and me. If it was closer to home, I would probably go there more but lukewarm fish and chips are not such an agreeable option. Other placesThe above places are merely my recent tastes of fish and chips. I have visited many more over the years. I love eating them by the beach, though I remember one place in Lorne that put so much salt on our chips that we were gasping for water for hours. I don’t tend to go to trendy modern fish and chip shops that have branched into foods like sushi (for example Sea Salt in Lygon Street down near Elgin Street in Carlton). And shops that specialize in chips such as Lord of the Fries, don’t quite seem to fit the bill either (though I do enjoy their chips). I have a soft spot for Barwon Fish and Chips in High Street, Belmont that has served our family many fish and chips. The best vegetarian substitute I ever found were the vegetarian dim sims at Monash University student cafe, but they seem to have disappeared from the menu. 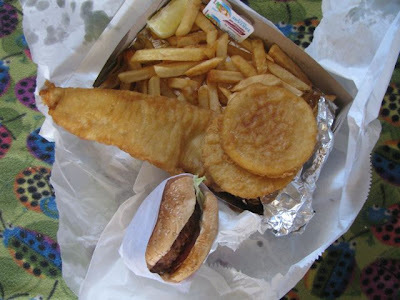 Much of the writing on fish and chips such as this article in The Age focuses on the best fish, but I seek the perfect vegetarian "fish and chips" - with no mock fish involved, mind you. 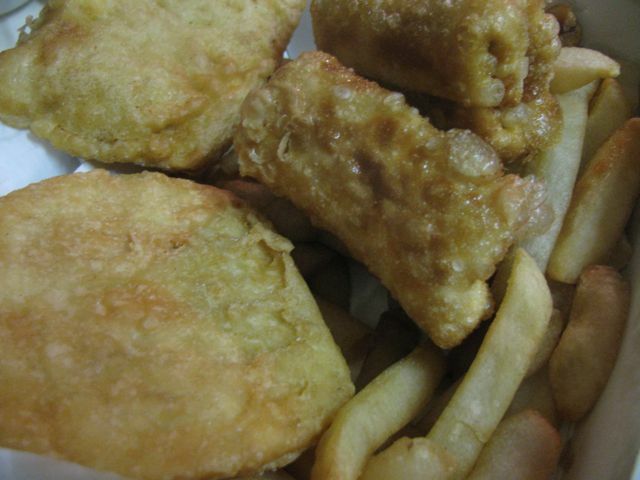 If I could find a fish and chip shop that sold the Monash Uni dim sims, I might reach my fish and chip nirvana. Meanwhile, I will still enjoy something close to it every once in a while. On Monday it was my turn to do morning tea at work. 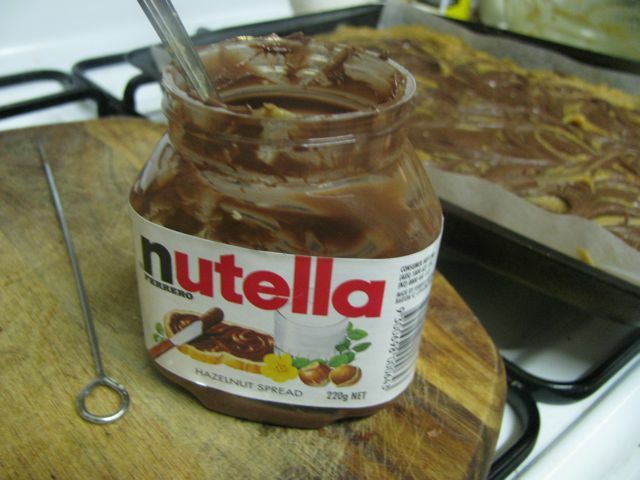 I had decided to make a batch of nutella brownies that I had found online recently. Cooking for colleagues means that I am not familiar enough with everyone’s tastes to feel I can experiment too much. This recipe seemed both safe and impressive. I had never encountered a “blondie” as a slice before I started blogging. Hitherto the term either referred to a hip post punk band, a silly cartoon or a patronising way to address women. I had had my fair share of Nutella in my childhood – our school canteen was into health food but they did sell little sachets of Nutella. But I have not really had much success baking with it. This slice showed me just how good blondies could be and one of the best ways I have come across to use Nutella in baking. If you are seeking either blondies or Nutella recipes, I highly recommend this one. I am backed up by my work colleagues who enjoyed them whole heartedly. 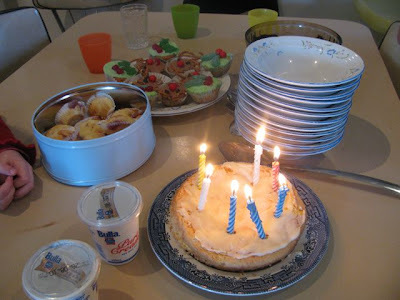 Just as well morning tea was a success as nothing else seemed to go well that day. 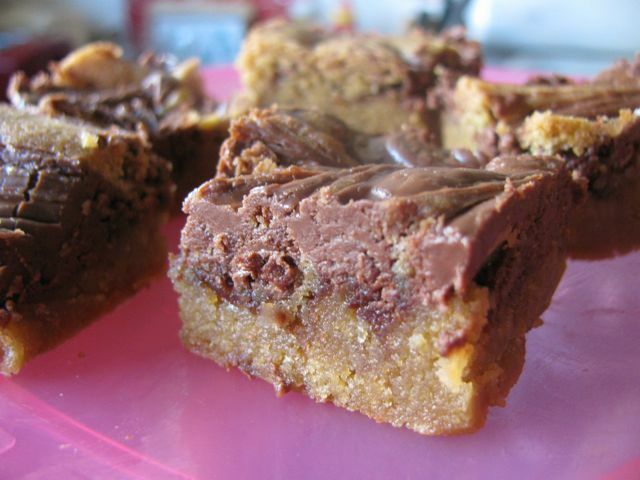 I am sending these nutella blondies to Champa of Versatile Vegetarian Kitchen for her weekly Bake-Off round up. This is an event that I have just discovered. It showcases a whole array of baked goods in the blogosphere, including cakes, casseroles, cookies, quiches, scones or anything else produced in the oven. Lots of great ideas. Finding out about blog events is always a bit of a challenge. I have some links on my blogroll but they constantly change. So I was pleased when Jacqueline, of Tinned Tomatoes blog, announced that as well as bringing up her gorgeous wee baby, keeping up her blog and co-hosting the No Croutons Required event, she has a new project - the Food Blog Diary that lists blog events and other food events. Preheat the oven to 170 C (325 F) degrees. Line a (9″ x 13″) lamington tin with baking paper. Melt butter in a large heat proof bowl in the microwave. Add eggs, brown sugar, castor sugar, salt, vanilla, flour, baking powder and bicarb soda. It will be quite a thick batter. Spoon batter into the prepared tin and smooth with the back of a spoon. Dollop nutella over the batter. Use a skewer to swirl it through the batter and make lovely designs. Bake for 25-30 minutes until the batter is puffed and golden but still a little moist in the middle. (The recipe warns not to overcook but my oven is not too powerful so I did 30 minutes without too much cooking however I felt it was quite soft in the middle once it cooled.) They will collapse slightly once out of the oven. Ever since starting this blog I have always recorded more cooking that I ever have time to post about. Some recipes I love but the right time to post them just never seems to arrive. Today my inspiration comes from my archive and this month’s No Croutons Required event rather than Bastille Day! I am excited to be finally posting a recipe that has been lingering in my notes since November last year. November seems a long time away because so much has changed since then. 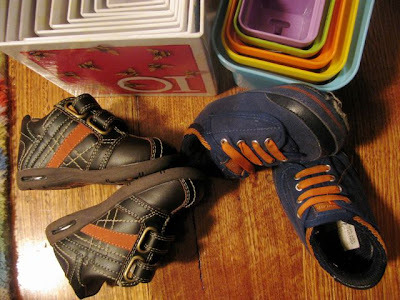 Back then, I was on maternity leave, we were still planning our trip to Scotland, the weather was getting uncomfortably warm, Sylvia was sitting and smiling, but had not started walking and babbling and pulling her socks off at every opportunity. She was still sleeping in her little white cane cot. I had other pressures then, but I was finding more time then to bake bread than I am now. I love good bread and wish I had more energy to try different flavours. 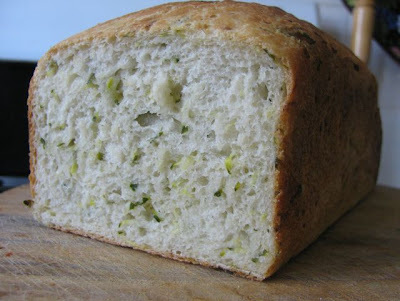 This zucchini bread was great. I made it after a purchase of fresh yeast necessitated some bread baking. The bread was soft with green flecks of zucchini and a golden chewy crust. I was a bit unsure if I had drained the salted zucchini enough because mine was incredibly moist and salty. Next time I think I would reduce the salt a bit but otherwise it was wonderful. Meanwhile, I have lots more recent recipes to post, as well as quite few from my backlog. 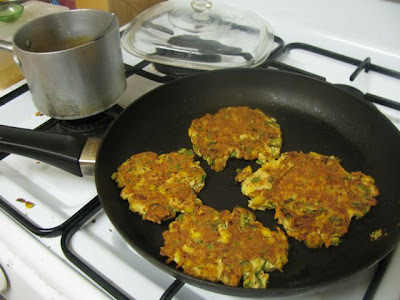 I am trying to cook at least one or two new and interesting dishes each week, often inspired by blogging. This week I have made a big pot of this tomato lentil soup. But I sometimes want the comfort and convenience of easy meals I have eaten since I was a child. Recently I just fancied some tinned tomato soup. Either of these tomato soups would be wonderful with this zucchini bread. 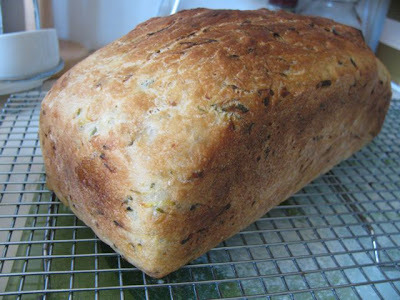 The zucchini bread was inspired by YeastSpotting, the weekly bread blogging round up, and I am sending my version back to Susan in gratitude. Grate zucchini into a colander and sprinkle with salt. Leave for at least 30 minutes and then squeeze out as much water as possible. 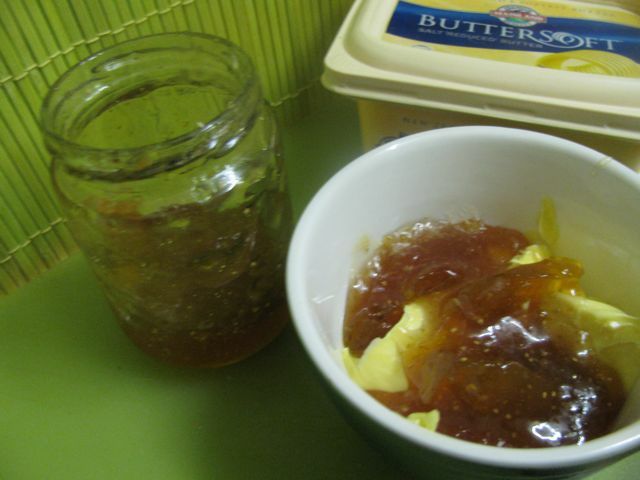 Combine the yeast and honey then ¼ cup warm water and 1 tablespoon of flour to make the sponge, If using fresh yeast, mix yeast and honey first till the mixture is liquid but if using dried yeast just mix all together. Set aside for 15 minutes until quite bubbly. Add drained zucchini and remaining flour (about 3 cups) to yeast mixture. Stir in 150-200ml warm water. My dough was very sticky so although the recipe says 200ml I would add a little less and see how it holds together before adding the remainder. 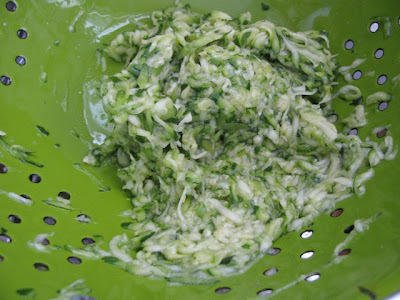 It also might be that I didn’t drain my zucchini enough and added more moisture this way. Tip dough onto a floured surface and knead for about 8 minutes until smooth and elastic. I added a bit of flour as I was kneading because my dough was so soft. Return dough to bowl. I didn’t grease my bowl but you could do if you prefer. Cover with a damp tea towel and leave to rise in a warm place until doubled in size. It took me about 1¼ hours on a warm day. Punch down the dough. Knead briefly and shape into a cylinder. Place on a lightly greased baking tray or a bread tin (I used the latter) and leave to rise for about 45 minutes or until doubled in size. During the second rise, preheat oven to 220 C. When bread is risen on baking tray or in tin, brush top with olive oil and bake for about 30-35 minutes or until golden and sounds hollow when tapped. Cool on a rack. 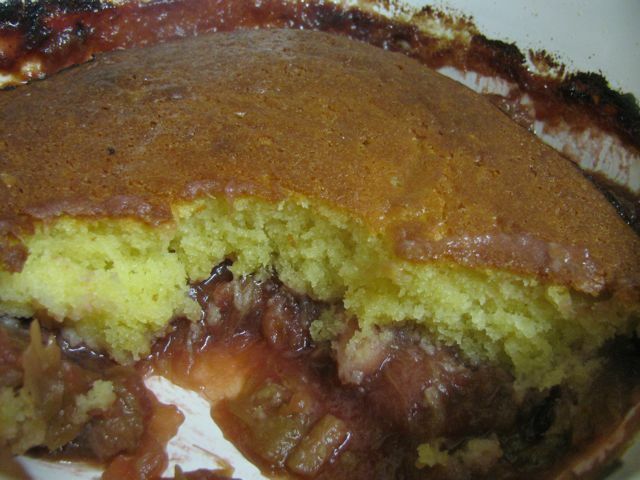 I made rhubarb and apple sponge last week. It was a comfort that we needed. It was a week of new life (congratulations Yav and Chris), illness and death. In our house we had nasty colds but more significantly my grandmother died. 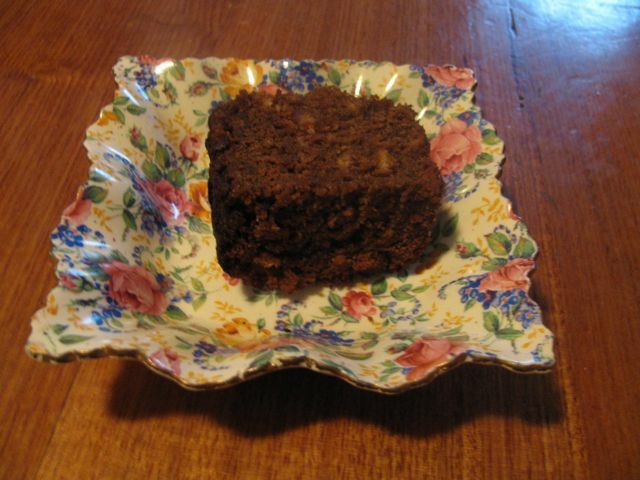 A warm pudding is just what she would have made to nurture us. My grandmother was loving and beautiful till the end. She was feisty and so independent that at the age of 91, just a couple of weeks before she died, she was still living on her own and driving her car to get to the shops. In fact, she didn’t die till she had said her goodbyes and was ready to leave us. She was a wonderful grandmother. Visiting her house as a child meant playing with the best collection of Barbie dolls and eating her lovely home cooking. After all, it was from her that my mum learnt to make roast dinner and puddings. She was lots of fun, buying us fluffy duck drinks even when they looks so sickly sweet that it was no surprise we couldn’t drink them, screaming at spiders with us, and if we were cheeky she would call us a ‘bold hussy’. She had a warm laugh and a wicked sense of humour. My grandmother loved to be in the kitchen and, like all good cooks, she made it seem effortless. Her Christmas cakes were the moist with a soft white icing. Her chocolate pudding recipe is a family favourite. We often had barbecues in her backyard, which had a sunken grassy area for entertaining or just relaxing. Beyond was the bush with lots of tea trees, reminding us how close we were to the sea. She loved her garden, encouraging birds to visit and her vegetables and flowers to thrive. When I admired her tomato chutney recently, my grandmother sent me a jar of it. In recent years she was more conscious of her health and was determined to eat well to keep herself in shape. This was a woman who had hit a hole-in-one on the golf course! 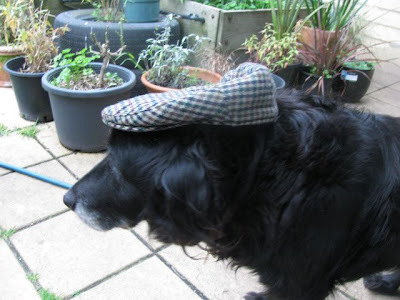 She loved a good wholesome loaf of bread but would whip up some scones and home made jam when we visited. 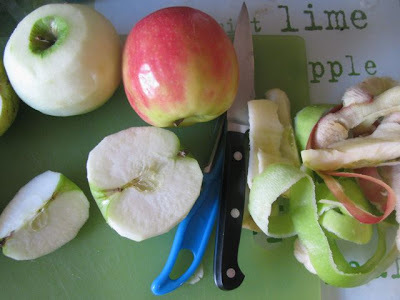 On one of my last visits I remember discussing how when we were young so many desserts had apple in them. My mum and my grandmother reminisced about how much cheaper apples used to be. It was a moment that made sense of some of my childhood. I will miss this window into my family history, back through the generations. One of the apple desserts my mum frequently made was apple sponge (like this dessert). For the uninitiated, it is a warm pudding of stewed apples topped by a buttery sponge and served with cream to every member of the family except me (I was the fussy one). 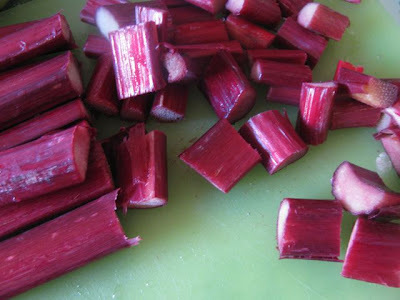 We also had rhubarb a lot as kids. 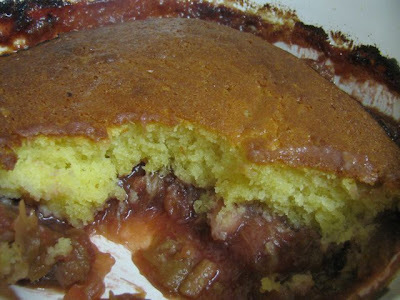 So when I saw Terry Durack’s recipe for Rhubarb and Apple Sponge in the Good Weekend a few weeks back, I loved the idea. It was like a fancy, richer version of my mum’s apple sponge. We all loved it, including Sylvia. So I bring you this dessert today as a connection to my past. For it is hard to talk about pudding without remembering my grandmother, always mixing up a bowl of batter, stirring something in a saucepan, bending over her oven to check on what was inside it, or just standing in the archway between her kitchen and lounge to give her opinion on any topic of discussion. She will be remembered fondly. * I had a bit more stewed fruit than in the original recipe so I took a bit out to feed Sylvia. I used two bunches of rhubarb due to over sweetening. You could halve the rhubarb and leave out the honey and lemon juice. 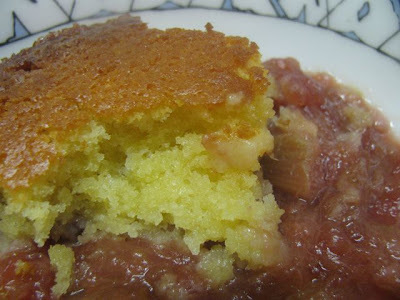 I should have followed the recipe and cooked the apples and the rhubarb for 10 minutes but instead I cooked the apples and about 1 cup of water for about 15 minutes, added the rhubarb, sugar and honey and cooked it another 5-10 minutes. It was too sweet so I cooked another bunch of rhubarb in a separate saucepan with a little water for 5-10 minutes till soft and then added it to the cooled stewed apple and rhubarb. Spoon rhubarb and apple into a greased casserole dish. Cream the butter and sugar. Beat in eggs, and fold in flour and milk. Spoon over the rhubarb and apple mixture and smooth with the back of a spoon. Bake at 180 C till golden brown and cooked inside. I thought it was done after 40 minutes (the time specified in the recipe) – the skewer came out clean but when I put the serving spoon in it was still uncooked. I put it back in the oven for another 40 minutes and then the sponge was fluffy and lovely. Serve hot as it is or with ice cream, cream or custard.